Cloud adoption leads to growing pains for SMBs. While new business tools and cloud services are often adopted to reduce expenditures and make employees' working lives more efficient and flexible, new research has revealed that the trend of using cloud services to optimise operations may have serious negative effects including loss of control over application security and valuable client data. In its latest report, entitled Growing Pains, Kaspersky Lab sheds light on the way in which SMBs and VSBs (companies with up to 49 employees) are experiencing growth pains when it comes to the use of cloud technologies to handle their business. Half (50%) of VSBs and 40 per cent of companies with 50-249 staff members (SMBs) have employees who regular work outside of the office and need to be able to access data and applications via the cloud. As companies become larger, they experience a growing need for cloud services with 73 per cent of SMBs and 56 per cent of VSBs using at least one cloud service with SaaS tools, email, document storage and collaboration services, finance and accounting being the most popular. The downside to this increased use of cloud services is that IT infrastructures in organisations that are consolidating more services and applications often fall short when it comes to providing the required levels of control and visibility. As a result, 66 per cent of both SMBs and VSBs experience difficulties managing these heterogeneous IT infrastructures. 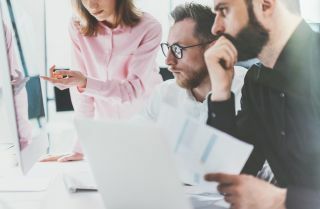 To make matters worse, 14 per cent of companies with 50-249 employees trust IT security management to staff members that are not IT specialists which opens up the organisation to new cybersecurity risks. Data security remains the number one challenge to VSBs and SMBs. However, 49 per cent of VSBs and 64 per cent of SMBs store valuable client data on staff members' mobile devices. If this data is leaked, it could result in serious damage to their company's reputation as well as financial losses resulting from litigation. “To enjoy the advantages of cloud computing regardless of the growth stage they are in, businesses need to effectively manage an array of cloud platforms and services. Fundamental to this is being able to clearly recognize who is responsible for cybersecurity in IT infrastructures that are continuing to increase in complexity. Whether it is managed by internal staff or trusted adviser, cybersecurity cannot be overlooked. All businesses should therefore establish a dedicated role within which the security of cloud platforms, sensitive data and business processes are kept under control”.